When you are finished editing, use the enter key (or click elsewhere) to save the changes. Escape key will revert your changes. 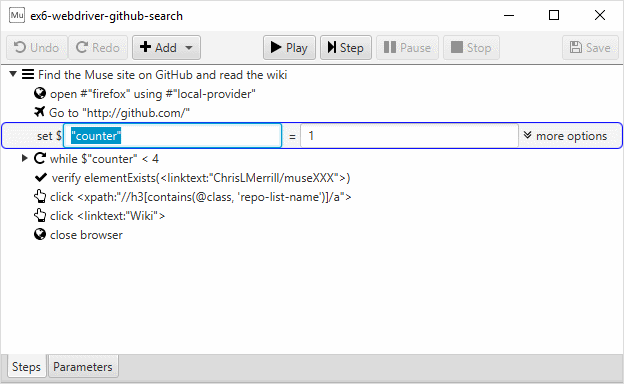 Some steps may have optional parameters that are not exposed by the in-line editor. To access these, follow the more link for the step editor. This editor will also be shown when the step does not support in-line expression editing. 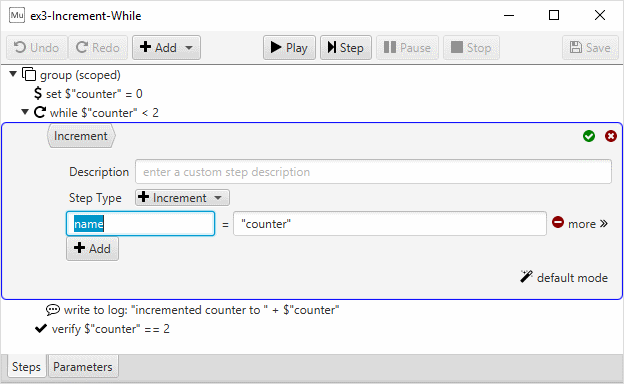 This editor allows configuration of all the supported parameters for the step, when provided by the step author. Optional parameters may be added and removed, and the description of the step may be changed. 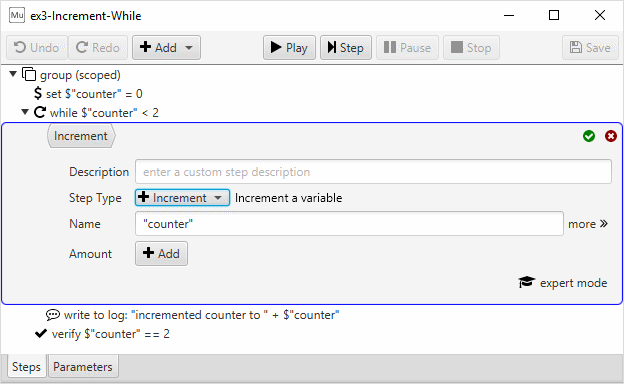 Note that the step description is not a value source expression, so the entry does not need to be surrounded with quotes. This lower-level editor looks very similar, but can create any configuration that is allowed by the underlying data structure. It is not constrained by the parameter declarations made by the author. This allows the tester to, for example, work around bugs in the declarations or make use of undocumented features of a step. It also allows you to create a configuration for a step that is not valid and could cause the step to fail in unexpected ways. Use the power carefully. Note that the expert editors do not enforce a configuration that is valid for that specific step or value source type. Refer to the step documentation for the valid value sources for a step. The Getting Started Guide demonstrates the command-line documentation tools. Also note that the parameter names are not value source expressions, so they do not need to be surrounded with quotes.